We’ve chosen the most exciting and defining events from the IT world to satisfy the most exquisite IT-tastes. Get your traveler’s bag ready cause for sure you will find something to attend! Every single minute brings innovations up to a new level, so we need to stay updated to make headway. Love it or loathe it, events and conferences in the world of technology is a must, as they gather startupers, investors, businessmen, and tech geeks to decide on the future of the industry. Attending conferences is the best thing you can do for your business, startup, or professional growth. 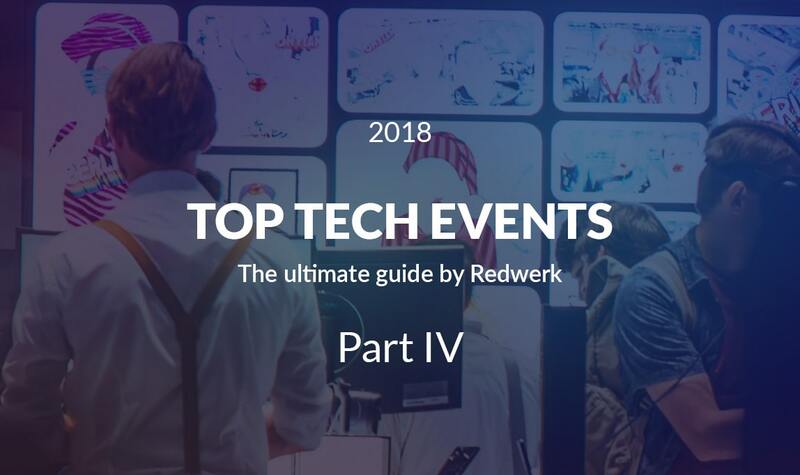 Want to collect the latest news about the technological world, then follow the list of the biggest technology events of Q4 2018 that Redwerk has carefully selected for you! Don’t miss the chance to listen to the brightest minds of very successful software business leaders. They will share the challenges and pitfalls of building and spreading software on the world’s market. Here, you will definitely extract new ideas and connections that will impact on your mind, life, and business. Become a part of like-minded community, share square talks, and make out like a bandit, visiting the greatest Business of Software Conference. IP EXPO Europe is the number one event in Europe for those who want to learn how the nascent IT innovations can push your business forward! Learn how the newest technologies will help create more scalable, flexible and efficient IT solutions. Learn how to create stronger protection against cyber attacks and recover faster if your system’s broken. Learn about the leading large data platforms and learn how cloud solutions can increase your budget. Learn how flexible architectures and continuous delivery become an integral part of your business. If you are an IT manager then learn from the best open source experts, see demonstrations from technology providers and get recommendations from them. All in one here, in London! Big Data Week is a worldwide one-day conference focusing on the social, political, and technological impact of data. This event draws together a global community of data professionals, who are eager to unpack the latest knowledge and discoveries about data. They unveil best practices and experiences that you can adopt to rocket your business. Feel big data buzz, anchor in London! World Summit on Artificial Intelligence is a unique platform for all innovations in the field of AI and projects related to AI. The two-day conference is devoted to three basic elements of artificial intelligence: Enterprise, Startups & Investors and Deep tech. World Summit AI will tackle the most knock-your-socks-off AI issues for 2018 and beyond. The brightest minds from every corner of the globe will be on stage to tell you everything you need to know about AI, and even more. Open Source Summit Europe is the leading conference for developers, architects and other technologists. At the sessions, leading associations and world IT companies will share their strategic views on the prospects for the development of information technologies based on the ideology and tools of Open Source, on how such technologies change society, the economy, and the entire nation. Come to collaborate, share information and learn about the latest in open technologies. IT industry is not only about coding, but promotion, as well. To network with peers, to learn the tactics the top industry executives use to grow business, join the Growth Marketing Stage in Kyiv this October. You will acquire brand new insights in content marketing, SEO, brand development, analytics, customer experience, CRO, and more, to enhance your power in building a successful growth organization. If you want to become an international product and growth manager, if you fancy learning to identify customers needs and make startups expand around the world, then don’t miss your chance and buy your ticket to the prime and biggest Growth Marketing Conference in Ukraine. INDustrial TECHnologies 2018 is dedicated to overspread innovative industries for smart growth. It gives free rein to showcase new solutions, to meet experts from industry, academia and policy, to exchange experience and to hot up collaboration. Meet and network with zilion of participants from more than 30 countries in Europe and across the globe, discuss ideas, and discover new services and technologies. Immerse yourself in the atmosphere of changing technology trends. Gain inspiration and confidence, boost your professional skills, enrich and push your business forward with the help of expert insights. Meet up here with exclusive speakers, solution providers, peers and industry experts, so that to make much headway in your organization or startup. Uncover solid cutting-edge project strategies, explore and analyze emerging solutions and astonishing connections between life, business and technology. Gartner Symposium is worthy of note if you strive for a sizeable and profoundly positive impact on your digital business. Web Summit is an IT conference that was born in Dublin and over 7 years has evolved from a gathering of local bloggers and entrepreneurs to the largest European conference with 50,000+ attendees, and speakers such as Elon Reeve Musk, Peter Til, Drew Houston, Tony Hawk. (P.S. they say those speakers are able to convince the Pope to have a Twitter account!). Well, if you are interested in networking with entrepreneurs from all over the world, or you are looking for investors, or just want to learn the trends, and, of course, if you want to boast that you’ve seen Elon Musk, come here to Lisbon. If you are thinking about creating your company, the conference will be a good place to sharpen the pitch. Even if you are not startupper, and are not looking for investors, Web Summit is an excellent place primarily for networking with peers and establishing new connections. So come and join the “best technology conference on the planet”. Explore keynotes, attend breakout sessions, participate in workshop events. Vendors, entrepreneurs and cutting-edge solution providers of business blockchain technologies will demonstrate hands-on tutorials and feature the forum with a top-notch technical showcase. They’ll all help you discover innovative approaches, trends and technologies to shape the future of your digital business. Three days of summit will fetch you maximum knowledge, useful contacts and great fast-track ideas. You also have to read our ultimate guide to top tech conferences in Q1 2019! Redwerk is a team of competent software developers, headquartered in Ukraine. We render offshore development services for customers from all over the world. Clients from European countries, Northern America, and Australia have satisfied themselves with our expertise, that covers software development, management, design and quality assurance. We create various solutions – web, mobile, cloud and desktop applications – on time and on budget.